Rivets or holes show as smooth circular forms. In the MOI+ image shown here there are two rivets with no cracks and two rivets with cracks. Cracks can be seen around the complete circumference of the rivet site in one pass of the imager over the aircraft. Surface images are viewed using higher frequencies (50 – 100 kHz). To penetrate more deeply into the metal, the inspector must lower the frequency level on the power unit. 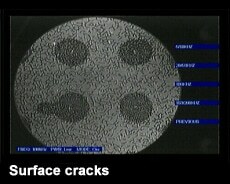 A crack between two rivets gives this effect, using MOI+ for inspection. This is viewed at a low power mode at 100 kHz. 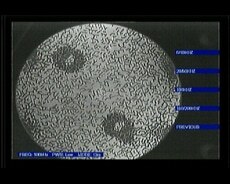 MOI+ image of a surface crack protruding from both sides of the rivet site. This is viewed at a low power mode at 100kHz. 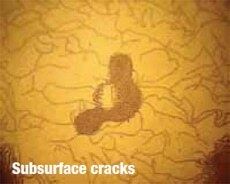 This MOI 308/7 image is a third layer crack image that is 0.084″ from the surface. The frequency has been set to 5 kHz resulting in a more diffuse image. 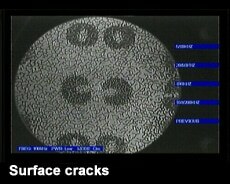 Since surface cracks will also be visible, it is important that the inspector perform a high frequency scan first and mark surface defects. 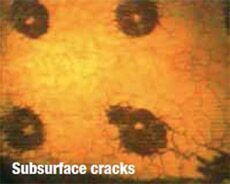 When the frequency is lowered, new crack images are subsurface defects. 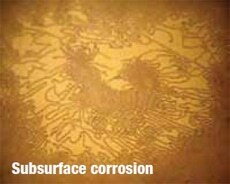 This is an MOI 308/3 image of corrosion on the aircraft bellyskin. Frequency has been set to 5 kHz. Corrosion images are irregular in shape and show as dark shadows between rivets or around rivet sites. In this sample there is a chem-milled step which shows as a dark line shape to the right of the corroded area. 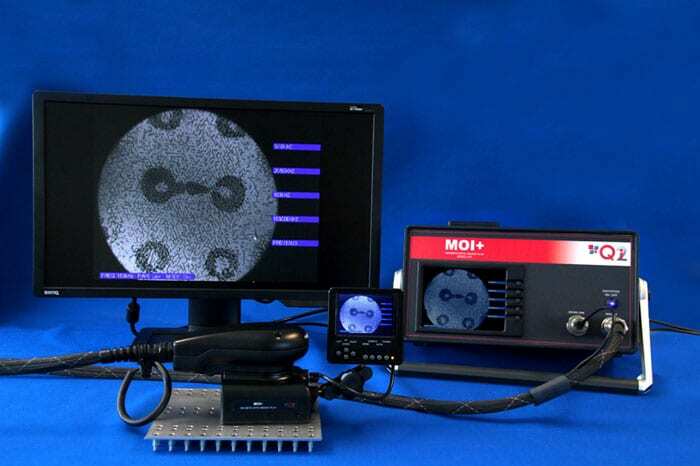 Since the MOI is an area inspection device instead of a point by point device (such as an eddy current probe) the MOI can rapidly locate corroded areas. The MOI 308/7 is also being used by the military to detect defective spotwelds. Good spotwelds show as very faint rivet like images. A broken spotweld image shows clearly. A technical order exists for spotweld inspection of the KC-135 aircraft. MOI 308/7 image of a small corrosion pit (dark area in the center of the picture). 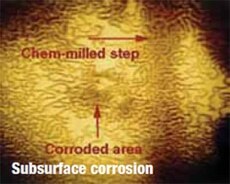 Corrosion is irregular in shape and can be most easily identified by moving the imager across the area being inspected. Corrosion is seen as irregular shadow shapes moving with the imager. 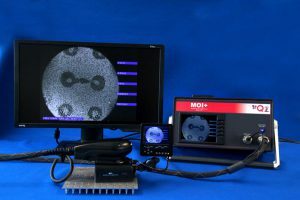 MOI+, along with previous models, includes Alodine inspection ability. 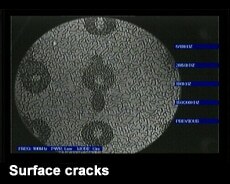 This image shows a surface crack in an Alodine rivet at 100kHz.